On September 19, 2017, we welcomed 85 community leaders to learn more about First Stage at our annual ImpACT event. In addition to hearing from our keynote speaker Danae Davis, Executive Director of Milwaukee Succeeds, attendees also learned more about the three pillars of our organization and how each one makes an impact on Milwaukee—one young person at a time. One such young person is Noah Wells, a nineteen year old from Wauwatosa, who has become a familiar face around First Stage. Since the program’s founding six years ago, Noah has participated in Next Steps. 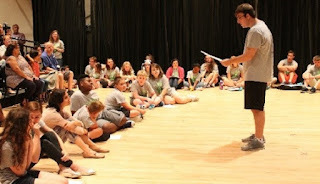 Next Steps expands our Theater Academy classes to young people with developmental disabilities—both verbal and non-verbal students, students with classic autism, PDD-NOS, other sensory processing disorders and Asperger’s—allowing each student to take his or her “next step” as an artist and as a person. Through Next Steps, First Stage creates a safe and welcoming environment where students can explore creativity, learn at their own pace, and be themselves without judgment or fear of failure. Guided by our philosophy of teaching life skills through stage skills, students participate in acting and musical theater classes led by a team of highly trained teaching artists and special education professionals. For the past four years, Noah has been hired to work as a Theater Academy Intern thanks to funding from the Rosemary Kennedy Initiative of the John F. Kennedy Center for the Performing Arts Office of VSA (Very Special Arts). 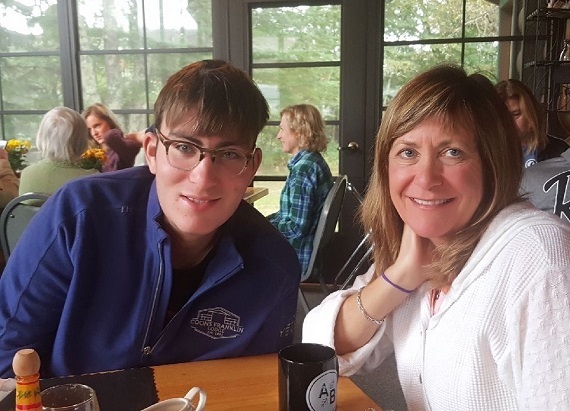 Due to the VSA grant, First Stage is able to provide paid internships for older students with intellectual disabilities and high-functioning autism. In the past five years, First Stage has provided the necessary accommodations to engage 16 Academy interns ages 15-22 with special needs. Through this unique leadership experience, First Stage provides these students the opportunity to serve as program leaders and role models while learning critical thinking, communication, teamwork, and problem solving skills. Next Steps also provides internships for typically developing high school Theater Academy students. Through this collaborative experience, the program helps build awareness and acceptance by bridging the gap between young people without disabilities and students on the autism spectrum. At the ImpACT event, Brenna Kempf, First Stage’s Associate Academy Director and Director of Next Steps interviewed Noah and his mom, Barbara Wells, and heard the following ways in which First Stage has made a difference in their life. Can you tell me about an important life skill that you learned at First Stage? What do you like about being a student at First Stage? What do you like about being an intern? How do you feel you have grown as an intern? This summer you were an intern for a younger group of students. What was that like? How do you feel about your involvement with First Stage?